Flaxengate Crag Quarry as it will be called is being constructed as an afterthought. Previously this area was just going to be a steep valley side. 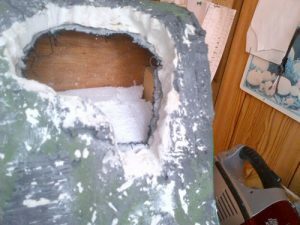 The idea for placing it on the layout was concieved by visiting the quarry above Crowden in the Peak District which had been dug out to provide stone for the Woodhead Reservoir Dams. The ficticious Flaxengate Crag quarry is justified by providing stone for the Flaxengate valley dam. Above you can see the area where the quarry is to be located. To me it is important for the quarry to look like it has been cut out of the landscape rather than it being something built upon the landscape. 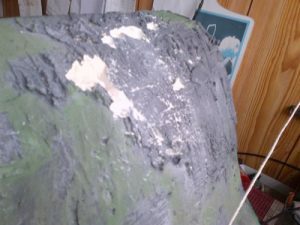 Here you can see the area cut out, evidence that I might have gone a little overboard with the plaster – it’s very thick! 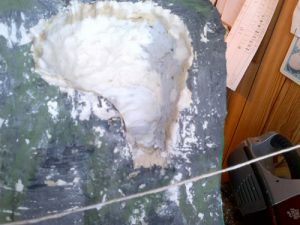 Toilet roll made into a mash with water and PVA glue has been used to fill up the inside and make the rock face.